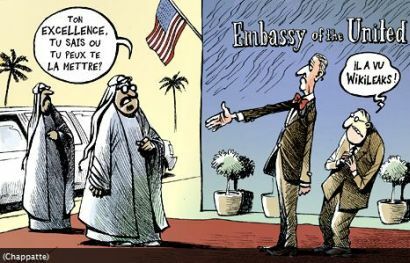 Could it be that the mammoth and embarrassing release of U.S. diplomatic cables by WikiLeaks is part of America's plans to undermine Iran? According to this news item from Iran's strictly state-controlled Kayhan newspaper, Iran's president has dismissed some of the cables that show Arab leaders nearly begging the United Stated to attack his country. Iran President Mahmoud Ahmadinejad says the release of U.S. diplomatic cables that reveal Arab determination to have him toppled is part of a U.S. intelligence operation. TEHRAN: Announcing that the Islamic Republic has accepted a date for talks with the major powers, President Mahmoud Ahmadinejad said on Monday that Iran's right to enrich uranium is "non-negotiable." "One of our rights is to enrich uranium and produce (nuclear) fuel. This is non-negotiable," Ahmadinejad told a press conference. "We proposed two dates and they accepted one of them. We have no problem with that," Ahmadinejad said, adding that the venue was still under review. But RIA quoted Iranian Ambassador to Moscow Mahmoud Reza Sajjadi as saying that, "the time of the talks is set for December 5 and the site of the meeting will be Geneva." President Ahmadinejad said, "The complete enrichment cycle and production of fuel are basic rights of (IAEA) member states and are non-negotiable." The powers want Tehran to curb its program in exchange for a package of trade and diplomatic incentives that have been on offer since 2006. 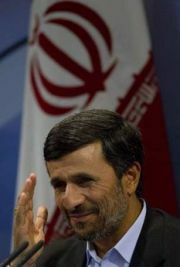 "We'll negotiate about nuclear cooperation," Ahmadinejad said. "We have always been ready for nuclear cooperation, but we will not enter talks over our obvious nuclear rights. We are now prepared to talk about nuclear trade." Ahmadinejad said that enemies of Iran have used computer code to create "limited" problems at some nuclear sites for the centrifuges involved in uranium enrichment. "With software they installed in electronic parts, they succeeded in creating problems for a limited number of our centrifuges," he said. "They did a bad thing. Fortunately, our experts discovered it and now they are unable to do so," he said. The president went on to dismiss the documents released by whistleblower WikiLeaks as "worthless" and "mischief" and said they would not affect Iran's relations with its Arab neighbors. "The documents they released are a mischief. We see no value in them. This is a worthless act," he said at a press conference broadcast live on state TV. "These documents are prepared and released by the U.S. government in a planned manner and in pursuance of a goal. This is an element of intelligence warfare and will not have the desired political impact." "We are friends with countries in the region, and mischievous acts will have no affect on relations," he said. According to an April 2010 memo, Saudi King Abdullah has repeatedly pressed the United States to attack Iran to halt its nuclear program, saying the U.S. should "cut off the head of the snake." The cables also allege that Abu Dhabi's Crown Prince Muhammed bin Zayed as early as 2005 expressed support for military action against Iran. King Hamad of Bahrain, meanwhile, told U.S. General David Petraeus in November 2009: "That (nuclear) program must be stopped ... The danger of letting it go on is greater than the danger of stopping it." Another message shows that Kuwait Interior Minister Jaber Khaled al-Sabah believes, "the U.S. will not be able to avoid a military conflict with Iran, if it is serious in its intention to prevent Tehran from achieving a nuclear weapons capability.